Saving One is #1 in HOT & TRENDING! thank everyone who took a few seconds to go to my campaign link to nominate Saving One for a book contract. 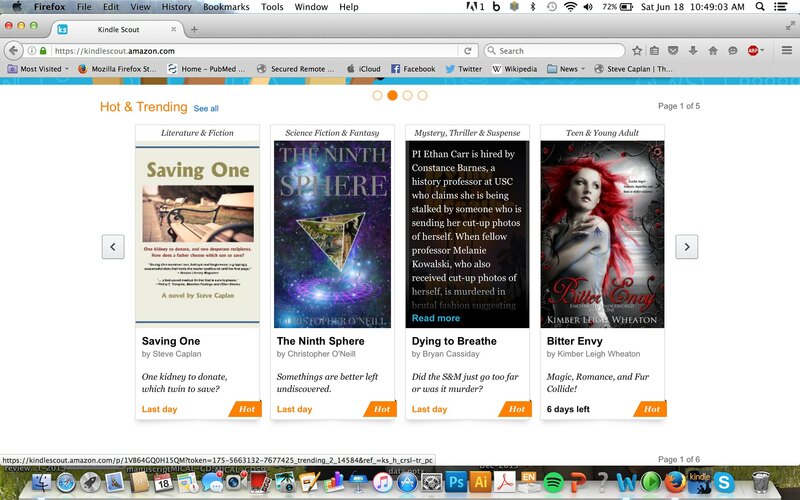 I do not know whether I will be offered one yet, but I DO KNOW that “Saving One” is ranked #1 in the HOT & TRENDING section of Kindle Scout, and has been firmly ensconced in this section for the past 24 h.
The campaign ends in about 11 hours, so for those of you haven’t yet had a chance to read the preview and nominate it, please support LabLit. It only take a few seconds, it’s free, and IF I am offered a contract, you will receive a free ebook to read. What do you have to lose? Thanks to everyone, and I’ll keep you posted. This entry was posted in research, science and tagged Amazon, ethics, Hot and Trending, kidney, Kindle, Kindle Scout, lab lit, Lablit, medical ethics, medical thriller, polycystic kidney disease, research, suspense, twins. Bookmark the permalink.